The Capitol was a popular subject for stereoviews during the peak of the medium’s popularity. 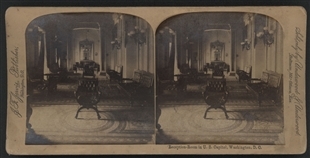 This period coincided with space reconfigurations within the newly constructed House wing of the Capitol, including that of this space, the House Reception Room. Formerly the Speaker’s private rooms and a post office, walls were removed in 1879 to create the well-appointed reception room pictured here. Elaborately patterned Minton tile floors and the bronze cherub sconces were part of the original 1858 design and remain distinguishing features of the space.